Photo site staffers say that mobile tools, like Photobucket's Android app, are one key to fending off competition from Facebook. (CNN) -- There's a photo-sharing website that, by some measures, is more popular than Flickr, Picasa and Photobucket combined. You might have heard of it. It's called Facebook. The emergence of the social-networking giant as a way to store and share photos has those established photo sites working to stay relevant. At the same time, a handful of new, upstart photo-sharing apps are seeking to carve out their own niches. In the end, the established photo sites say, it will be their ability to do more -- particularly in the rapidly expanding world of mobile photography -- that will set them apart. Most photo sites offer similar tools for cataloging, editing and sharing photos, along with ways to display them in albums and slide shows. Until recently, it has been easy enough for these sites to brush off any threat Facebook may pose. The easy argument, and one that still exists to some extent, is that Facebook is only good for simple snapshots that don't need any editing and are designed more to document an event than render an artistic image. "Our users like to share, they like to edit, they like to create," said Tom Munro, who took over as CEO of Photobucket last month. "All of that you can't do on Facebook. Most people don't want all their photos on Facebook. You really can't do a whole lot with them once they're there." But Facebook, which can parlay its userbase of roughly 500 million into relative success with most anything Web-related, is trying to chip away at that argument. Last month, Facebook announced it was upgrading its Photos service to include high-resolution photos, group tagging and a lightbox for viewing photos from anywhere on the site. Some of those changes were clearly designed to compete with the specialty photo sites. Numbers-wise, Facebook dwarfs the competition. According to Web analytics firm comScore, Facebook Photos had nearly 98 million visitors in October. Photobucket remains narrowly atop the photo sites with a little over 25 million visitors, according to comScore, with Flickr at 21 million and Picasa drawing nearly 11 million users. Picasa was the only photo site comScore charted a year-to-year comparison for, and its traffic increased about 14 percent from October 2009. In comparison, Facebook Photos users more than doubled, from 47.6 million a year ago. It's probably safe to say, however, that a lot of those clicks represent casual glances instead of folks who come to photo sites specifically. More than 3 billion photos are uploaded to Facebook every month, according to a recent estimate. And in the past few weeks, others have thrown their names into the online photo bucket. Path aims to be a sort-of anti-Facebook (or, perhaps more of an anti-Twitter, where popular users can have 1 million-plus followers), allowing users to share photos with no more than 50 friends. The new app picplz (pronounced "pic, please") lets users share photos to Facebook, Myspace and Twitter. Pixable, which just got a $2.5 million venture capital infusion, turns photos from Facebook and other sites into animated videos. At Yahoo!-owned Flickr, head of product strategy, Matthew Rothenberg, said he doesn't see Facebook's numbers as a problem. "We look at Facebook almost more as a partner than a competitor," he said. "We have Facebook integration, integration on Twitter. "Our mission is to be the best place to put your photos and share with the people who matter to you. If the people who you care about happen to be on Facebook, we want Flickr to work great with all of those things." He highlighted features like geotagging which embeds images with geographical coordinates. The site hosts more than 184 million location-tagged photos, he said. Flickr also has been a leader in mobile photography, offering mobile uploads since 2005. "The number-one, most-used camera on Flickr right now is a camera phone -- currently the iPhone," he said. "I have a [digital camera] gathering dust in my closet right now. Obviously, there's still a place for high-end cameras, but we are increasingly seeing more and more camera phone usage." Flickr has a mobile app for multiple platfoms. It has been downloaded 5 million times for the iPhone alone. Munro said Photobucket has its own slate of plans to keep up. In the next few days, the site has a planned ravamp to give it a more intuitive look and feel, he said. 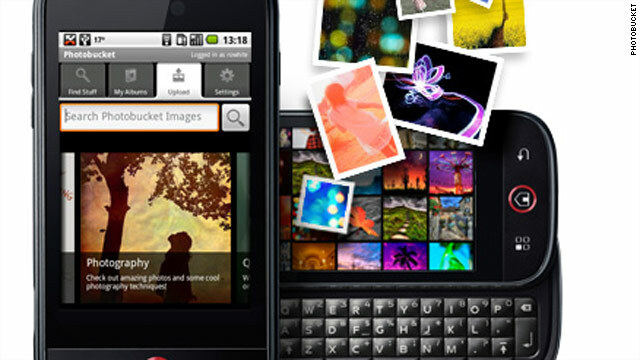 A second update, he said, will bring bigger and more fundamental changes to Photobucket. Although he wasn't ready to give away details, it seems likely that additional mobile features could be part of the package. "You're kind of hinting at a direction we're looking at for the future," Munro said to a question about an app that could instantly share Photobucket images with multiple sites. A spokeswoman for Google-owned Picasa provided a list of features the site trumpets as setting it apart -- including automatic face-recognition software and tagging "that really works," photo montage and collage creation, and a state-of-the-art desktop client: Picasa 3.8. It's those sort of advanced features that these photo sites say will keep them ahead of their new challengers. The sites will need to constantly evolve to keep up with a rapidly changing digital world, they said. "The real goal of online photo share is to make sharing photos online the same kind of rich and wonderful experience that sharing photos in the offline world is," said Tara Suan Kirchner, Flickr's head of marketing.